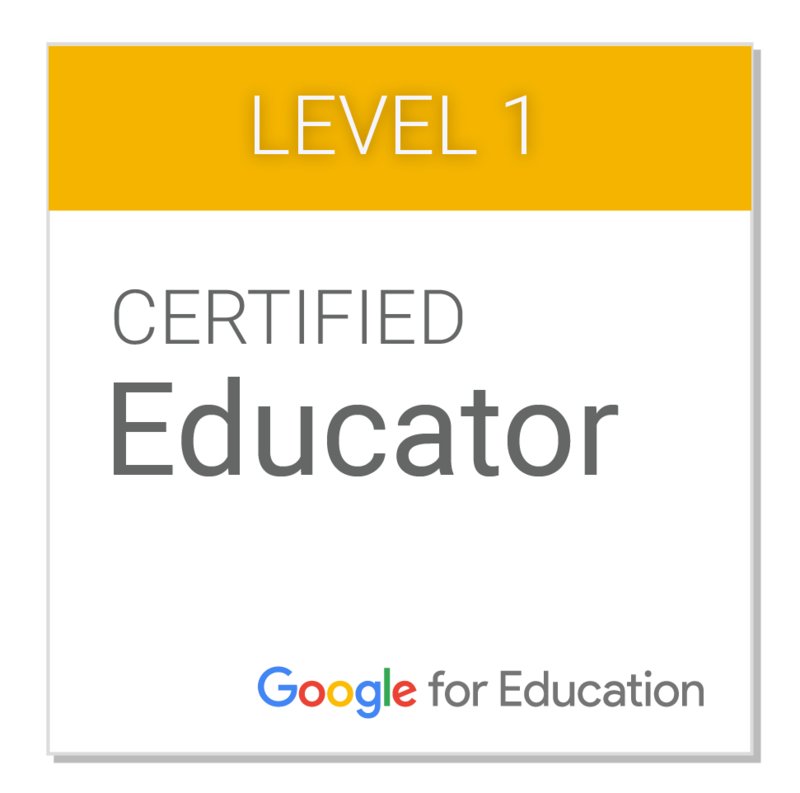 I passed the Google Certified Educator Level 1 exam yesterday! The test took me a little over 2 hours. I had looked over the lesson material very very briefly and took all of the unit reviews before taking the exam. Most of the content I knew, but there were definitely some things that I had to read up on. I think I only got 2 of the unit reviews 100% correct the first time. While I was taking the exam, I had my school computer that was taking the test, because it’s the only one I have with a working webcam, and then my old old personal computer that I got in college and is only used a few times a year was next to it with my Chrome open and all the different lessons bookmarked. I did have to look up a handful of things, so I’m glad I had it there. If you’re going to take it, I suggest you have some other way to access Google to answer some questions during the test. If you’re wondering about whether it’s worth it, I’m not sure. 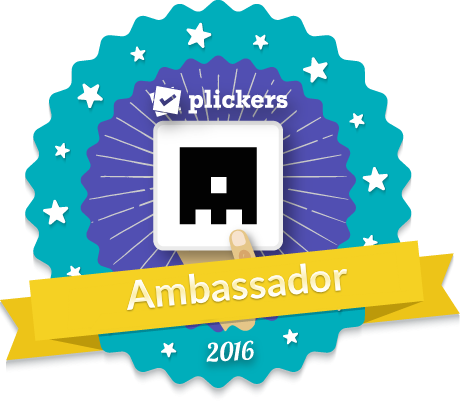 I have a badge now, and I guess I can put this on my resume. But I more have a sense of accomplishment because I was pretty nervous. I also honestly got some ideas from the scenario questions that I’m excited to use as soon as (or if) my district lets students all have access to email through their accounts. Next step is Level 2, some day. Les insignes numériques: insignifiants mais aussi demandés. So I really do like the concept of number talks. Using things like Fawn’s http://www.mathtalks.net/ and http://www.visualpatterns.org/. Using Sara’s Visual Pattern strategy. Doing dot talks and having the kids use a thumbs up and then additional fingers to indicate how many ways they can visualize or find the solution. I think it’s great and I want to do it all in my classes. But I just haven’t been able to get it to work. It’s always just like 10% of the class that is actually into it, others just putting a thumbs up so I can move on and then saying “I don’t know” when I ask them to share. These number talk days also take the longest out of all my warm ups, probably because I want to go farther into them than most students want to. And it kills me because we’d get great work done on the patterns or number talks, but really it would be me and a few other students and the others would just be checked out, waiting for me to finish so they could copy it down. As I’m writing this, I am realizing Dylan just basically posted about the same thing, and he actually put out a possible solution. Thank you Dylan. The issue I see in my classes for Dylan’s method is that it just takes a lot of time. I no longer have the luxury of the 90 minute block. I have 50 minutes, and that’s not a lot of time. But it might be a good idea to try this with partner work for a little bit next semester. Maybe I can shave it to 1-2 minutes on your own, 1 minute partner share, 1-2 minutes full class discussion? Maybe I just stay satisfied with not getting to the formula in the warm up unless we fly through it. I will say this, though: I have way more students engaged in the visual patterns than in the number talks, like which is greater out of 88 x 36 or 86 x 38. I think numbers just freak some kids out. I really really really want to keep doing visual patterns at least in my warm ups, but I just don’t know if I can make it actually happen for all of my students. Any other helpful hints? Does anyone else have this experience? Une note incohérente, mais j’ai besoin d’aide.